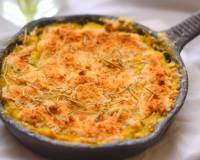 Give this lip smacking Roasted Cauliflower & Broccoli Gratin a try for a weekend - it's topped with grated cheese which is crusted golden. 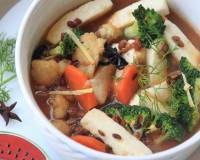 Serve it along with a vegetable clear soup and herbed garlic bread for a weekend dinner. Cauliflower Broccoli Au Gratin is a classic French dish with a golden crust, formed from browning it in the oven or under the grill. 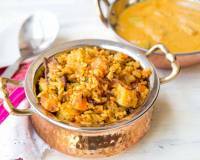 As fancy and exotic as the name sounds, the dish is pretty easy to make. Cauliflower and Broccoli Au gratin is a great way to dress up the humble vegetables and serve them in an exotic way. 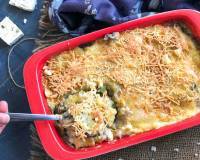 To make the Cauliflower and Broccoli Au Gratin, Cauliflower and Broccoli florets are baked in a creamy white sauce topped with cheese. 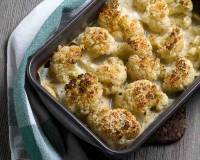 Serve Cauliflower and Broccoli Au Gratin on its own for a hearty meal along with Vegetable Clear Soup and a Herbed Garlic Bread for a special weekend dinner. Whole Wheat Mushroom Spinach Calzone. To begin making the Cauliflower Broccoli Au Gratin, first prep all your ingredients. Heat oil in a deep pan and add the onions and garlic and cook till onions turn soft. 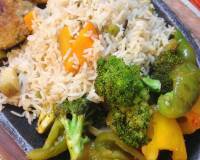 Add the cauliflower and broccoli florets, sprinkle salt and stir fry the florets until they are cooked through yet firm. The next step is to make the white sauce. 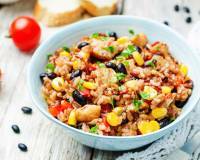 In a saucepan add milk and corn flour, black pepper, mixed herbs and salt. Stir well until the cornflour is well combined and there are no lumps. Place the saucepan on heat stir continuously until the sauce thickens and the sauce is completely cooked through. The sauce will have a shine to it. Once cooked through, add the cheese spread and stir till the cheese melts. Turn of the heat and keep aside. The next step is to assemble the Au Gratin. Preheat the oven to 180 degree Celsius with broiler mode. Grease a 8 inch by 4 inch baking dish and first add the cauliflower and broccoli. Then top it up with the white sauce and stir slightly. Spread grated cheese evenly at the top. Place the cauliflower and broccoli Au gratin dish on the top shelf of the oven and bake for ten minutes till the cheese melts and turns golden brown in colour. 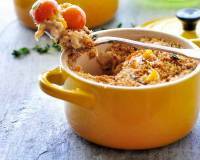 Once done, remove from the oven and serve the Cauliflower Broccoli Au Gratin hot for dinner. 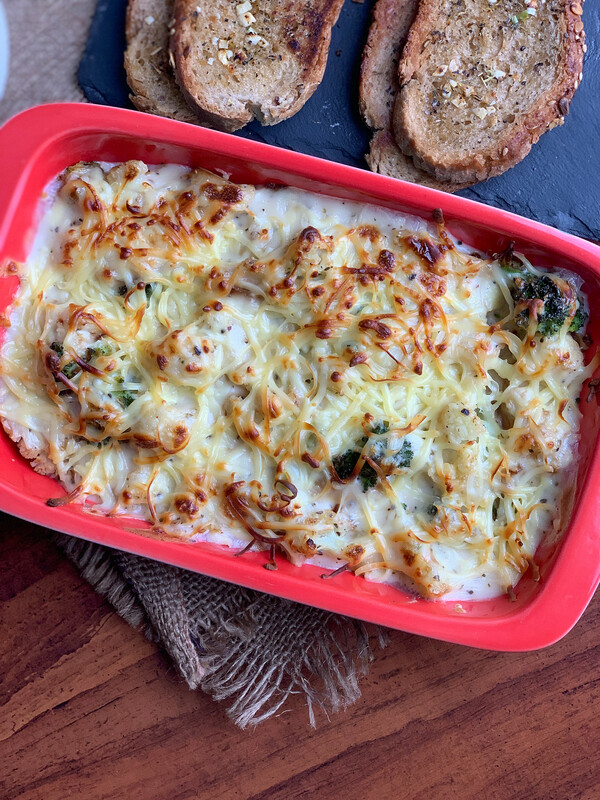 Serve Cauliflower Broccoli Au Gratin on its own for a hearty meal or as a side dish for a potluck/get together with Whole Wheat Pizza with Egg, Bell Peppers and Fresh Basil or serve along with Whole Wheat Oats And Pesto Bread.